Everyone does a good job, I see really good renders here. Ok, here's what i've got so far. Trying to go for a relaxed, intimate mood with this render. Still need to add some decor and adjust the lighting, but i'm pretty happy with the pose so far. I do have some issues with the mirror, the reflection has a lot of artefacts, as if it's rendered at a lower resolution than the rest of the scene. I guess i can render the scene at a much higher resolution and resize the final render, but i'd prefer to fix this problem in it's origin. Any ideas what's causing this ? All lights are spotlights, the main light (front above) has ray trace on, the others deep shadow map. All with a little softness applied. 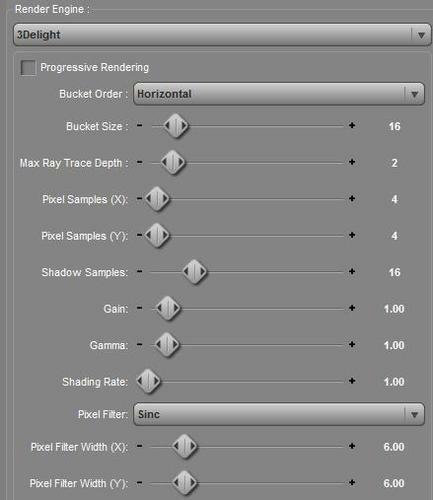 Here is some good info about render settings http://rubicondigital.host22.com/index.php/articles/poserdazstudio/4-optimising-render-settings-in-daz-studio . Yes it is old but a lot of the info is still current. To be honest I can see, at that resolution (size), the artifacts you mention. It could be down to the softness of the shadows so increasing the Shadows Samples and decreasing the Shading rate to about 0.20 which increases the overall quality of the image. You could also decreasing the Max Ray Trace Depth to 1. 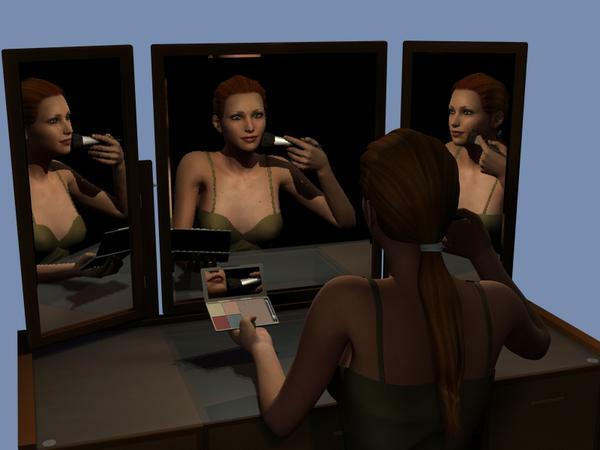 0 will give you no reflections so start with 1 for one reflection, 2 for a reflection of a reflection and so on. I followed your tips, and the render is coming out much better now. It's not completely gone yet, but i'll crank those settings up some more for future renders. But first gonna do some reading, so i'll learn wich knobs to turn and wich sliders to slide. I'm such a dweeb, I was thinking about the Align Tool in DS3 it's picky about which Item is picked first. Not SnapParent. DUH! BlackFeather that's some good work you've got going. I agree. Only thing I would do is put something behind the camera, so out of view, that will give her a background also reflecting in the mirrors. I know how I would do this, but not certain if something similar can be done in DS. Yep that works in DS as well. I've been trying to do another image and all of a sudden got this. What does this message mean? I'm not 100% sure but I think it means one of the Shaders Errored out. Did the Render Crash or keep running after that message? I just found this thread which shows a similar error message http://www.daz3d.com/forums/discussion/4872/ plus googleing it I found this all the way back to Daz Studio 1.7.
it kept on going, but the result was very dark. I've switched the surface option to other than matte and then it rendered without a mistake. This is the image in the works. I have to dug up a violin soon and make it fit. Also with it I tried to tackle with the water for the first time. 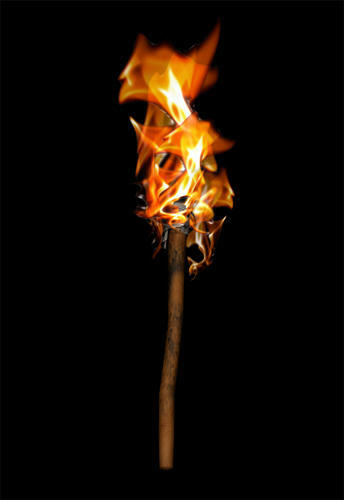 I downloaded this neat torch from ShareCG yesterday and would like to use it in my next scene. The thing is I would like to use a different flame but can't work out how to ungroup the prop so that I can hide the flame. Wondering if anyone can help. 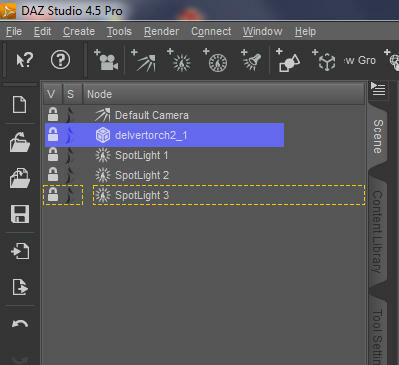 Check the Surfaces Tab on just the Torch If it has a Materials zone for just the flames set the Opacity to Zero or the Diffuse and Opacity maps to none. This is looking good. Are you going to use different lighting? If so I would Spot Render the water after you set up the lights, it might need some tweaks. Thanks Jaderail, set opacity to zero and now its gone. I want to use the prop a couple of times and it would look odd if they all had the same flame. This is my entry for the comp with a prop, would be great to have some feed back back on what I could do to make my render better. Wrong Thread. Go to the September WIP thread and Post your image to it. still trying to get use to these forums. is it possible for me to take one of them off? I could, but it might as well stay now, no probs as it is the WIP image, and once Jade gives you some tips you will be posting more, we hope, THat's waht WIP threads are all about. Chohole what's this when Jade gives tips stuff? Okay, okay you know I'm gonna give tips. So where we go. Wiibb I need to ask a few questions first to understand your point of view with this image. 1. Is the large Spear/Halberd supposed to be in the females hand? 2. Did you add it as a layer in postwork? 3. Is the Chain supposed to be on the Lycan's neck? 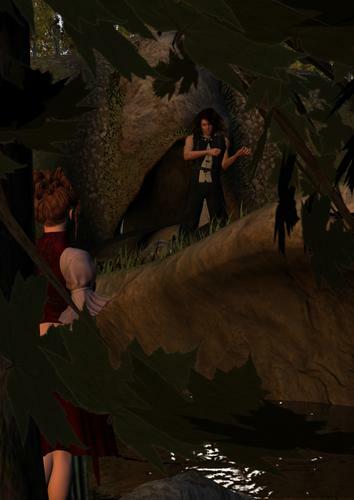 Hi Jaderail, yes the Spear is supposed to be in her hand. It is a prop from Daz I had a lot of trouble trying to fit it in her hand correct. I even went and looked for that Script Szark mentioned 'Snap to hand' but could not find it. 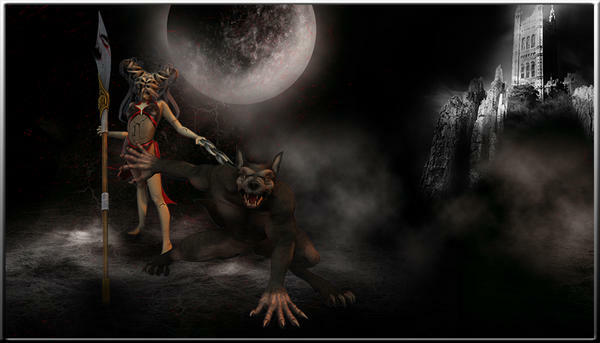 Yes the chain is supposed to be on the Lycan's neck that was done in post work.